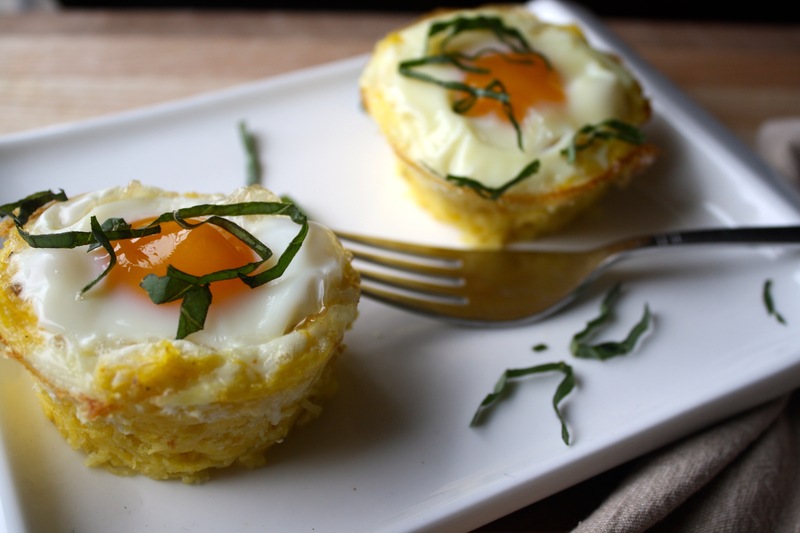 Make these healthy egg-in-a-baskets for busy, on-the-go breakfasts throughout the week. 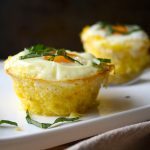 Cheesy spaghetti squash cups get filled with an egg and topped with basil for an easy and satisfying breakfast. Some people can skip breakfast, but I am definitely not one of those people. I love anything breakfast; eggs, yogurt, scones, coffee. Even the occasional, decadent cinnamon roll or syrup-covered waffle is great, but let’s be real, I can’t eat that for breakfast every morning. I try to start my day off on a good foot and that means a satisfying, healthy meal. Some weeks that looks like a couple of scrambled eggs with a side of berries, other weeks it’s yogurt with nuts and fruit or oatmeal piled high with toppings. Whatever it may be, it better be delicious (of course), easy and contain a good amount of protein to keep me going through the morning. These spaghetti squash baskets fit the bill. I make one batch and they get me through most of the week. 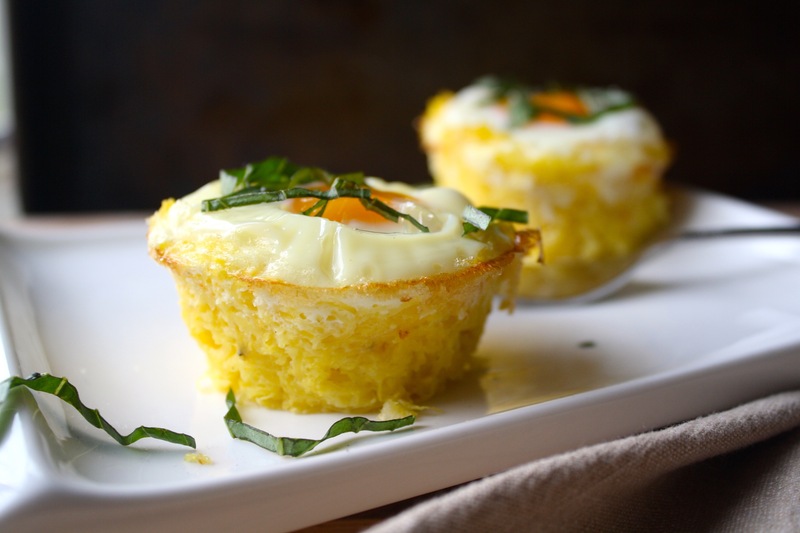 These healthy egg-in-a-holes are the perfect breakfast to keep you satisfied all morning. Utilizing spaghetti squash keeps these light, while the Parmesan cheese lends a nod to decadence. A custardy sauce transforms spaghetti squash to create an ideal vessel for a perfectly cooked egg. Serve warm, topped with fresh basil, tomato sauce or salsa. Preheat oven to 350°F and place rack in middle position. Grease 8 muffin tins and sprinkle each cup with corn meal to coat bottoms and sides. Set pan aside. Cut spaghetti squash in half, lengthwise. Using a spoon, scrape out the seeds. Lightly sprinkle halves with salt and water. Place halves, cut side up, in a shallow glass dish. Microwave for 6—8 minutes until centers are slightly soft. Using a fork, scrape out the flesh of the squash and separate the squash strands as best as possible, transfer to a medium mixing bowl. Add ¼ cup grated Parmesan cheese and olive oil, mix until cheese is melted and evenly incorporated. In a small mixing bowl, combine an additional ¼ cup Parmesan cheese, corn meal, egg, milk, sea salt and black pepper. Mix to combine and pour over squash mixture. Mix to evenly coat squash with sauce. Transfer ¼ cup of squash mixture into each of the 8 muffin cups. Using your fingers, push the squash up the sides of the cup to create a “basket” for the egg. Crack an egg into each squash cup and transfer pan to oven. Bake for 20–25 minutes until whites have set and yolks still jiggle slightly. Allow baskets to cool in the pan for 1–2 minutes. Use a knife or spoon to loosen edges around basket, top with fresh basil, marinara or salsa.